Many were impressed with how light this shoe felt on-foot. Those who tried the Nike FL-Rue were pleased with the comfortable feel and fit it provided. This two-piece casual sneaker is available in various cool colorways. This version was considered lightweight and breathable by most of the users. Several Nike fans thought this shoe is great for everyday wear. “Nice” and “fresh” were words used by most wearers to describe the FL-Rue’s silhouette. This product is sold at a reasonable price point. Some retailers are selling this model at a marked down price. Out of the handful user reviews collated about the Nike FL-Rue, one purchaser thought this sneaker lacked support. The shoe’s materials wore out quickly, another buyer disclosed. In March 2017, Nike released the FL-Rue but it came unnoticed as it was overshadowed by different Air Max shoes’ debut. Despite the lack of ads and marketing campaigns, it still managed to gain a loyal following from Nike supporters who were able to catch a glimpse of its unique silhouette. Popular or not, shoes always get its fair share of criticisms and the underrated Nike FL-Rue is not an exception. Regardless, this affordable off-the-court sneaker was still praised for its ultralight construction, clean aesthetics, and eye-catching color schemes. March is a month most awaited by a large number of Nike fans who adore the iconic Air Max. While most were preparing for the anticipated “Air Max Day”, the global giant decided to drop the FL-Rue without much notice surprising sneaker enthusiasts with its innovative design and unconventional looks. For years, the brand has been known to combine the elements of their classics with their new designs. The Nike FL-Rue is undeniably a product of one of the brand’s fusions. While this lifestyle shoe’s upper is perceived as one-of-a-kind, modern and sleek, its sole borrowed elements from Nike’s retro hoop sneakers. Although minuscule, those with a keen eye would notice this shoe’s familiar-looking curved midsole which resembles Gary Payton’s Nike Zoom Flight ‘98 “The Glove”. The outsole with a track spike-like traction pattern, on the other hand, is similar to Jason Kidd’s Air Zoom Flight V B introduced in 1997. Despite being a fairly new entry, this lifestyle sneaker did pretty well. Satisfying consumers with its modern design, lightweight construction and comfortable in-shoe feel, its fan base is slowly yet steadily increasing. Thus, we can expect to see more of this product in the future as it has the potential of being a future crowd favorite. A game of basketball is truly tiring for the feet, thus a change of shoes is unavoidable. Those on the lookout for an off-court sneaker that is both stylish and comfortable can consider buying the Nike FL-Rue. Sporty yet fashionable, it can easily be paired with tapered jeans and cuffed joggers. Lightweight and breathable, it is also perceived as an affordable after-the-game shoe option that is capable of providing pillow-like cushioning underfoot. Hoop shoe-inspired, this lifestyle sneaker, crafted with a leather and neoprene upper and built with a bootie-like construction, provides adaptive fit and reliable support. Made for men, this model, which is offered in Medium D width in sizes 6.5-15, commonly fits true to size. Distinguished for its unique two-piece upper, the perforated leather is durable yet breathable and the neoprene gives the shoe sock-like comfort. Its wavy sole unit with a track-like traction pattern is just as impressive. 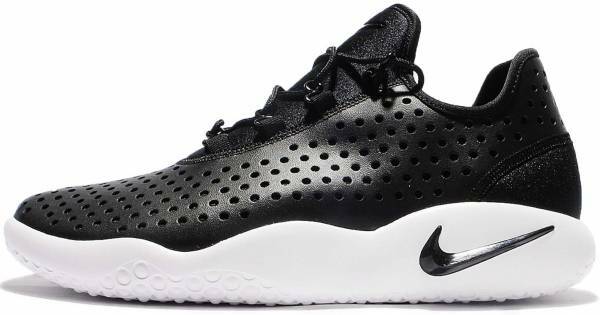 Although reminiscent of retro b-ball sneakers, the Nike FL-Rue features a visible Zoom Air unit that offers responsive cushioning. This easy to slip on shoe also features dynamic webbing for a lockdown fit. The fit is further improved with the addition of the asymmetrical lacing system. This includes rope laces that match the color of the upper. The lightweight midsole of the Nike FL-Rue doubles as an outsole. Its rubber pods improve the shoe’s grip and shock absorbing properties. Ankle coverage is enhanced with the ¾ high profile of this sneaker. The padded footbed helps improve the shoe’s comfort level underfoot. This sneaker is available in a wide array of colors namely black, anthracite, white, light bone, gym red, blue moon, plum fog and palm green. All of which display a white sole unit with a jeweled “Swoosh” logo on the lateral side. For branding, another “Swoosh” logo can be found on the tongue. A Nike callout can also be seen on the heel.